We are SO excited to be back participating in the cookie exchange over at Poofy Cheeks again this year! We will be co-hosting the cookie exchange link party with Poofy Cheeks and a number of other talented bloggers on Monday so get your cookie recipes ready!! Today we’re going to share some delicious Peppermint Christmas Cookies. 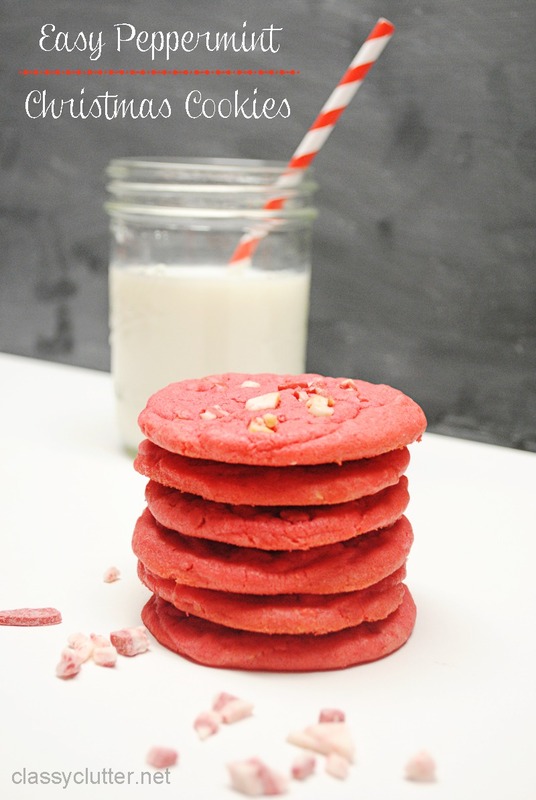 They are so soft and chewy with a little peppermint crunch! You will love these. Preheat oven to 340-350 degrees. What? I know. If you have an older oven, 340 seems to work perfectly so they don’t over bake. If your oven temperature is pretty accurate 350 should be fine. Combine brown sugar, white sugar, eggs and butter flavored shortening and mix well. Add in flour, baking soda, salt, vanilla extract and red food coloring until you like the color. It took quite a few drops to get it a pretty red. You can make them red or leave it out if you would like. Stir in peppermint baking chips. I used about 1/3 of a bag. 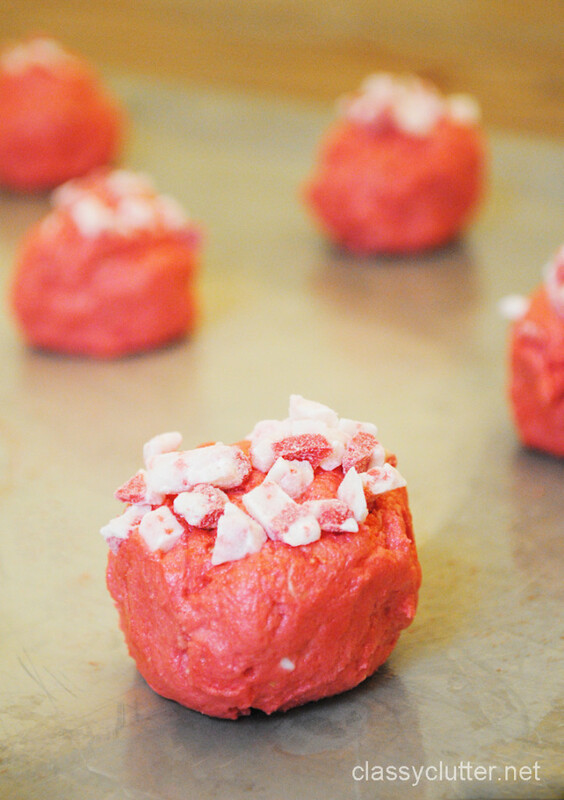 Roll cookie dough into small balls and place on lightly greased cookie sheet. I dipped the top of my dough balls into the peppermint chips before placing them on the cookie sheet. Let cookies cool for about 3-5 minutes, then transfer to a cooling rack. Enjoy! These would be so cute wrapped up for a gift with a big candy cane bow! Recipe adapted from Sugar Baby Boutique. Need an easy Christmas gift idea? 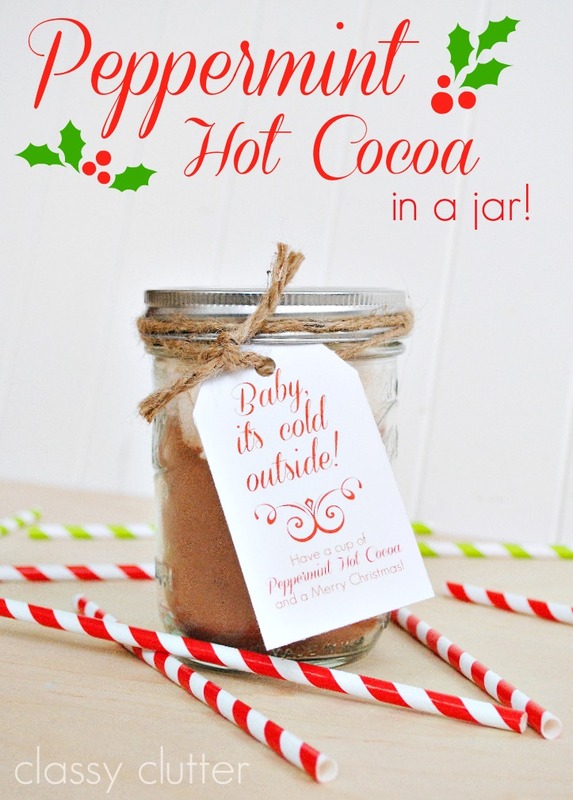 Check out this Peppermint Hot Cocoa in a jar! 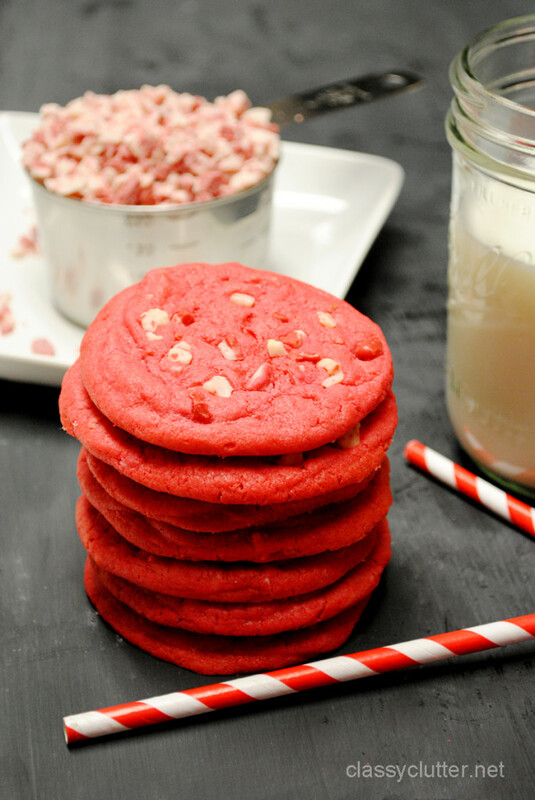 This looks fantastic ladies – I love the added red food coloring for fun! Thanks so much! They’re really yummy!! I bought the ANdes peppermint baking chips , but got the creme de menthe ones 🙁 I didn’t know there were two kinds. Do you think those would work as well? Ive made these twice now and they end up being a big blob on cookie sheet. The on my thing that didn’t use was the oats because I don’t see where it was used. I was wondering about the oats too. they don’t seem to fit in with the recipe. They give amazing texture to the cookies! I use them in my chocolate chip cookies too!